The new product from Dr. Paul and Karin Herzog's laboratory! Hyaluronic acid smooths the skin and helps fight against the appearance of age. The natural and organic clay give the color of the product. Knowen for it's mattifying properties, it will perfectly blend with your skin tone for a unified look. It Contains a slight sun filter, essential in all day creams! Indian goosberry extrait, an efficient anti-oxident, will help protect your skin throughout the day. You will be amazed by this cream's delicious smell. 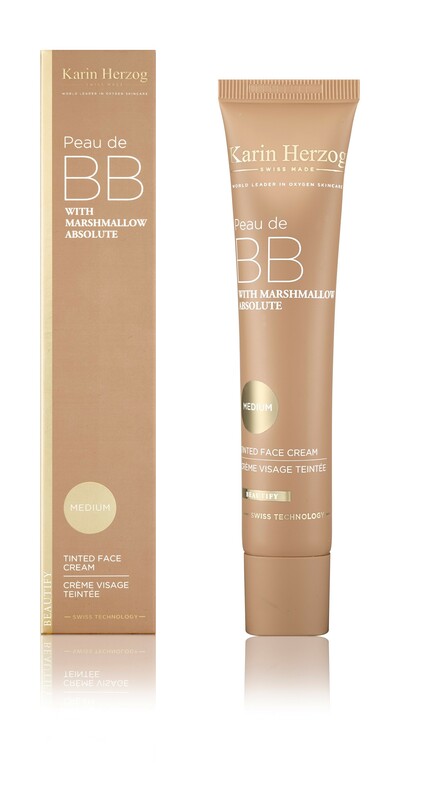 With extract of Althaea Officinalis, also knowen as Marshmallow Absolut, applying cream has never smelled so good! This formula is non-comedogenic, adapts to all skin types and will provide you with a conforting feeling ; all this while making your skin look great! Aqua, Alcohol denat, Petrolatum, Glyceryl stearate, Montmorillonite, Titanium dioxide, Paraffinum liquidum, Tocopheryl acetate, Polysorbate 80, Stearyl alcohol, Cetyl alcohol, Isopropyl myristate, Phyllanthus emblica fruit extract, (Iron oxides) CI77491 77492 77499, Bis-ethylhexyl hydroxydimethoxy benzylmalonate, Salicylic acid, Ethylhexyl methoxycinnamate, CI 77891 (Titanium dioxide), mica, tin oxide, Althaea officinalis root extract, Sodium hyaluronate, Citrus limon peel oil, Daucus carota sativa seed oil, Parfum, Methylisothiazolinone, Formic acid.